Automotive in-wheel motors have recorded a remarkable surge in sales in recent years, influenced by multiple factors ranging from greater driving range per charge to elimination of components such as driving and differential shafts. 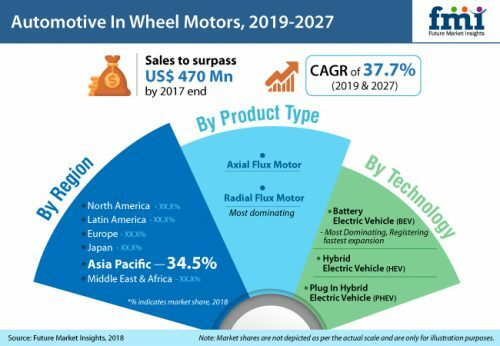 According to a study of Future Market Insights (FMI), the automotive in-wheel motors sales will exceed 720 thousand units in 2019. Affordability of in-wheel motor in terms of power consumption relative to the traditionally employed central drive unit system will continue to uphold its preference by automakers in the near future. Elimination of unnecessary components is one of the primary adoption determinants of automotive in-wheel motors, as they significantly reduce the weight of battery-electric vehicles (BEVs), while crawling up on vehicle electrification and lightweighting trends. BEV accounted for over 7 in 10 automotive in-wheel motors sold worldwide in 2017, according to the study. A key trend influencing BEV-specific in-wheel motor sales is miniaturization and integration of inverter, which features a compact design. Automotive in-wheel motors are likely to remain touted as a sustainable future alternative to propulsion systems used in powertrains. With promising future prospects of BEVs, and palpability of optimized hydrogen fuel cell technologies, certainty spotlights automotive in-wheel motors’ promising prospects in the upcoming years. The study opines that passenger cars will continue to retain their reign in the automotive in-wheel motors market, with approximately 637 thousand units expected to be sold in 2019. Key offerings with affordability, such as improved vehicle dynamics and lower design complexity in power transmission to wheel, continue to drive adoption of automotive in-wheel motors in passenger cars. Passenger cars integrated with in-wheel motors enable enhanced traction control, along with torque vectoring functions devoid of added bill-of-materials. The automotive in-wheel motors market grows in tandem with penetration of electric vehicles is significantly backed by the regulations on vehicle emission, as nearly 20% of these emissions result directly from fuel evaporation. Contribution of these zero emission vehicles to environment pollution is insignificant, despite their indirect impacts during electricity generation and storage. Key players in the automotive in-wheel motors market have come up with novel solutions to offset latent challenges faced in terms of deployment, operation, and functionality. Companies such as Protean Electric have claimed to have overcome obstructions related to use of automotive in-wheel motors, such as road shocks and additional mass, along with complexity associated with motor control software. Protean’s new automotive in-wheel motors make drivetrains highly energy-efficient, while increasing the fuel economy over 30%. On the other hand Nissan has developed automotive in-wheel motors for the working prototype of the company’s futuristic concept car. Companies such as Ziehl-Abegg have introduced automotive in-wheel motors that enable application in fuel-cell, battery-operated, and hybrid commercial electric vehicles. Permeation of electrification trend in the automotive space shows no signs of abating, with prospects revolving around motor and charging technologies that are becoming more multipurpose and sophisticated. Robust uptake in electric vehicles worldwide has led automotive OEMs to catch up with efforts on the development of second-generation motors, wherein performance, noise, and efficiency are deemed key imperatives. Higher levels of auto parts integration, and sturdy, compact packaging of powertrain components are some of the imminent developments in the automotive in-wheel motors market. As benefits of automotive in-wheel motors continue to outweigh challenges faced in their deployment and functionalities, along with efforts toward offsetting the latter, industry leaders have directed their focus on R&D activities. These researches are primary aimed at design developments to impart mechanical, electrical, and thermal stress resistance to the automotive in-wheel motors during their operation. This FMI study also offers forecast on the automotive in-wheel motors market for the period between 2018 and 2027. The automotive in-wheel motors market will record a staggering CAGR of over 35% through 2027.